When I think about my dream home, it isn’t a structure or building. My dream home to me is the place where I live. I love my little town! I am originally from Twin Falls, Idaho so I was raised in a smaller town. While Twin has almost doubled in size from my childhood days, I have always dreamed of living my adult life in a small town (a VERY small town). My dream home is a place where everybody knows everybody else. A place where I can go for a stroll in the evenings, holding hands with my husband and saying hi to my neighbors, stopping periodically to talk about nothing in particular, just a friendly chat. Where I can go into the local store or gas station and the clerks know me by my first name, and we share a common interest in the events of each other’s lives. Then as I head into the big city to begin my work day, I know that I will be coming back to the safety of my little town where I am loved by my neighbors and them by me. My husband and I moved to my dream hometown over a year ago. In this very short period of time, yes, we all know each other and, yes, it is the friendly little town that was always in my dreams. We are close to fishing and hunting, we have a post office, a small library and a gas station – which seems to be the hub of most of the town activity! Notus is one of eight “cities” in Canyon County. Canyon County is near Idaho’s capital city, Boise. Our little community is very active with all sorts of fun activities all throughout the year. One of my most favorite events is our 4th of July Parade that goes right through our little subdivision! How many people can walk down to the end of their street to enjoy an old fashioned 4th of July Parade! Other events include our Harvest Festival where the entire town participates in our scarecrow decorating contest, along with street vendors, hayrides, and live music. We also have the Community Easter Egg Hunt, high school football games and old car shows at the local (and somewhat famous) Garage Café. 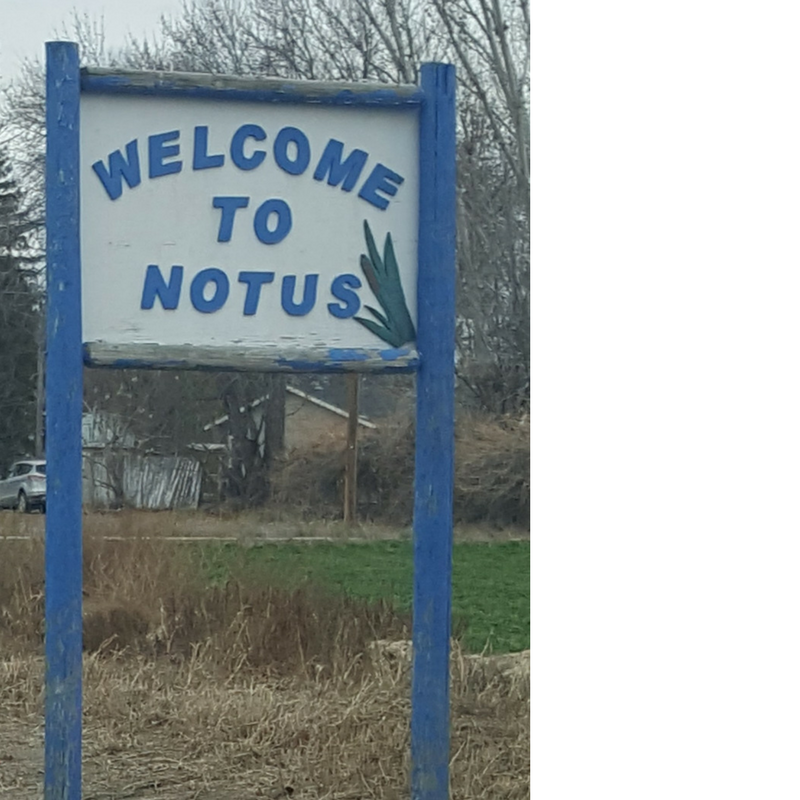 Notus is located 35 miles West o f Boise, Idaho off Interstate 84, Exit 26. So if you are in the area stop by and see us! Though you must pay attention or you might not Notus us!